Born in Fayette, Missouri, Vivian moved with her family to California in the 1870s, settling at Sacramento; but by 1889 she was already a fixture in the Los Angeles art community. She studied art at various public and private institutions, and in 1897 she was in Paris at the Académie Colarossi, then in London, before returning home to teach at San Jose State and the California College of Arts and Crafts. 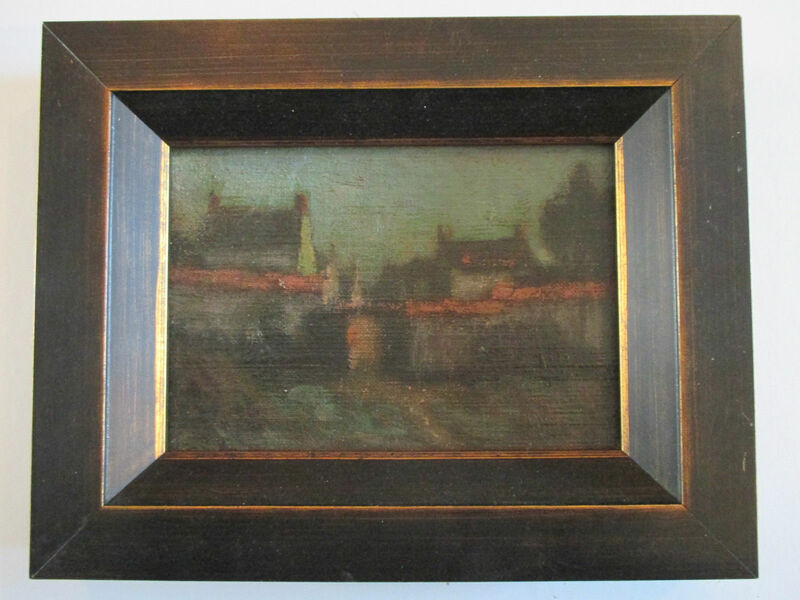 If this small painting—twice the size of a penny postcard—was done plein air at Barbizon, rather than from memory, it would date before 1900. Though this was painted at Barbizon, France, near the Forest of Fontainebleau, the “Barbizon School” of the early 19th century introduced a more realistic approach to landscape representation. “Moon Over Barbizon” is far more Impressionistic and typical of the century’s end, rather than its beginning. By agincourtiowa in Landscapes & Livestock, Uncategorized on Monday/20/April/2015 .